In 1964, the first US arrival of four lads from Liverpool changed the course of music history, as well as world history – forever! Their mere presence in a room made adolescent hearts throb and traffic jam for hours in every major city they toured. We are talking about none other than The Beatles, whose contribution to music defined an era. They affected every area of life including fashion, hairstyles, politics, protests, war, religion, and yes, peace and love. Most of us never got to see the Beatles in-person because we either couldn’t afford to buy tickets, or were just too young to stay out past 8 PM, but we were able to cling to an old album cover or photograph, hoping one day to catch a real glimpse of the Fab Four. Well, today, “Strawberry Fields” is here, a look-alike, sound-alike Beatles tribute, dedicated to bringing you, the audience, as close to a real Beatles concert as you can get. The band features true look-alike performers, handpicked from hundreds of auditionees, who speak in Liverpudlian accents and play on the vintage musical instruments that Beatles fans have come to recognize. Strawberry Fields at B.B. King’s. “Strawberry Fields” has been performing to audiences of all ages for over a decade and in the past has shared the stage with featured guests from the Broadway cast of “Beatlemania;” Steve Holly, drummer for Paul McCartney who was featured on his second solo album, “Back To The Egg;” Billy J. Kramer (one of Brian Epstein’s original British Invasion stars); Tony Sheridan, who recorded an entire album with The Beatles, themselves; and Pete Best, who (in case you’ve been living under a rock for all these years) was, early in their careers, the drummer of The Beatles! We have enjoyed many press reviews from several acclaimed journals and raves from fans everywhere. 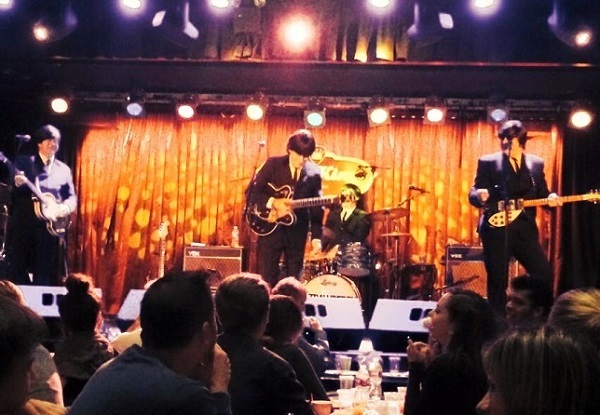 We’ve most recently performed an exclusive engagement for “EMI” at “Ruby Foo’s” in NYC, not to mention our 2005, one-time-only 40th anniversary recreation of The Beatles’ historic 1965 concert at Shea Stadium… Shea Stadium! Wow!!! Every Saturday for the past seventeen years “Strawberry Fields” performs live at B.B. Kings in Times Square for a very special Beatles Brunch. I had the chance to interview Band Leader Tony Garofalo about the history behind the music. Cognac: Welcome back darlings I am Cognac Wellerlane and we are here at the fabulous at B.B. King Blues Club & Grill right here in Times Square, New York and I am here with the Band Leader Tony Garofalo. It’s all about Strawberry Fields. It’s all about a Beatles tribute band. Tony: All you need is love. All you need is love darlings. All you need is love. So tell my audience the history behind the music. Tony: Well first of all the Beatles is my opinion and the bands’ opinion is the greatest music ever written and to be able to perform the Beatles music and do a show with a look alike sound and a look alike routine is just amazing thing and I have been doing it for over thirty years. Tony: I started Strawberry Fields in 1991 and I wanted a group of players all alumni from Beatlemania and Co, the original touring show on Broadway. We wanted a show that we could show the same type of guys. The four core members of the band and get together and do a Beatle show in full costume. We give people a chance to see the Beatles that never got to see the Beatles either they were too young or couldn’t afford tickets or it was too late to see them. So you are here to bring that memorabilia back that nostalgia back. Tony: Beatles music is iconic as well as the four individual Beatles themselves. We have been doing it here at B.B. Kings for this show seventeen years already. Seventeen years. Now I understand that some of the band members are from the original Beatlemania on Broadway, am I correct? Tony: You are correct. Our Paul McCartney is Billy J. Ray. He was in the original show that ran at the Winter Garden Theater, La Fontaine and the Palace Theater and he is still with us and doing the show and our drummer Michael Bellusci from the touring co. Our guitarist (George Harrison), John Korba… he has been on tour with Hall and Oats, Phoebe Snow and Roseanne Cash. He is from the Broadway Show “Rain and Let it Be” and the touring company “Beatlemania.” so we have a long, long history of Beatles. Band Leader and Founder Tony Garafolo with Cognac Wellerlane. Another question I want to ask were you ever able to meet Paul McCartney? Tony: I actually met Paul McCartney two years ago. I went to his show in Brooklyn a The Barclay Center and I was on his guest list for the VIP party after the concert and went backstage and essentially hung out with him for about a half an hour. Oh my God that must have been the thrill of your life. Tony: It was a thrill. We played at Shea Stadium as the Beatles in 2005 to commemorate the 40th Anniversary of the Beatles at Shea and Paul McCartney and Ringo Star actually did the announcing on the diamond vision screen. They announced us before we came on. Paul McCartney knows all about Strawberry Fields. He has a house on Long Island. Yes, he lives in the Hamptons where I frequent in the Summer. That is coming up I will be in the Hamptons every weekend. Maybe I will run into Mr. McCartney. Tony: He is in Amagansett where I will have an ice cream. Yes this is a great thrill for us and like I said this is the longest running Beatles Show on Broadway. Unbelievable. Now let me ask you, you must have a favorite tune? Tony: You know, I love the early mop top music. Tony: The Ed Sullivan Show… all that stuff and I loved the first five albums but I also love “Sergeant Pepper’s Lonely Hearts Club Band.” I mean there is no limit to my taste as far as what I like in the Beatles. Because the music sort of evolved, it changed… they used orchestration later on and to me each song is totally different. For an artist to write a song and each song totally different and for it to become a hit it just amazes me. It is just as popular now as it was back in the sixties. Now there is also going to be costume changes today as well. How many costume changes will we see? I can’t wait. I am all excited. Also you have a very famous car which I was very happy to interview your fiancé and she talked about your car at length… the exact replica of the Chitty Chitty Bang Bang Car from the film. When am I going to see that car again? Tony: You will get to see it again. We are going to be at Summer Walks in Wyandanch in Long Island. We will be doing a walk for Cancer and we are expecting a very large crowd. Chitty Chitty Bang Bang will be live. It will be on display and we will be driving it ’round. It was a great movie. Those of you who love the movie you will definitely want to watch the movie again after you see the car. I can’t wait to hear the music today. I want you to tell my audience where we can go to find out more information about Strawberry Fields. Tony: You can go to StrawberryFieldsTheTribute.com and you will see the whole story. Tony was born into a musical family, with a mother who was a professional dancer and teacher, and a father who is both a 25-year guitar teacher and professional Carnegie Hall alumnus with the New York Mandolin Orchestra. Tony has been playing guitar since 1969, and is also trained in the fine art of classical guitar, mastering pieces by Bach, Beethoven, Sor, Julian Bream, and Andrew Segovia. He has also served as a veteran NYPD police officer for 20 years, and has risen to the ranks of both Detective and Sergeant in his career, with over 700 arrests to his credit and has worked in the central robbery unit, narcotics division, detective division, and internal affairs bureau. He was very well known by colleagues and police brass as the “real” Sergeant Pepper. Tony was also a key contributor in the September 11th rescue and recovery effort both at Ground Zero and the Staten Island Fresh Kill location. Tony has continuously perfected the role as John Lennon throughout the 80’s and 90’s, performing with countless incarnations of Beatlemania, and has been grateful to have had the opportunity to perform with many Broadway Beatlemania alumni such as: Billy Ray, Mark Vacaccio, Don Linares, Alan Lebouff, Glen Bertnik, and Peter Santoro, to name just a few. In 1991, Strawberry Fields was created by Tony in an effort to bring forth a complete Beatles performance package that was accessible to every type of audience and to every type of budget. This unique formula has proven successful over the years, opening the doors for Strawberry Fields to perform at almost any type of musical situation: amphitheaters, stadiums, theaters, car dealerships, weddings, bar mitzvahs, high school reunions, birthday parties, outdoor festivals… the list goes on and on.